The loin and the ham make up 50 percent of the pork that is sold in supermarkets. Modern pigs are bred with less fat, which can result in pork that's easy to overcook and dry out. Since the loin is so lean, you'll need to add some fat to keep it juicy. 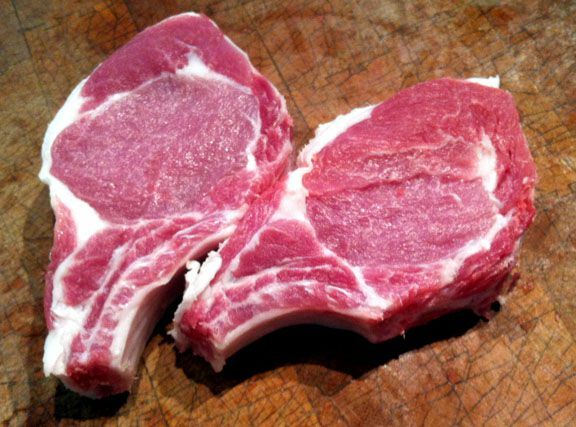 As a general rule, when you're buying pork chops, get the bone-in chops; they're more flavorful than boneless and have enough marbling of fat to keep the pork moist when cooked. Butchering by Sebastian Cortez, Sebastian & Co. The loin rib chop is cut from the rear of the loin and is similar to a beef t-bone steak. The rib chop can be cut with a portion of tenderloin, like a porterhouse steak, so that one side of the dividing bone is firm loin meat, and the other smaller side is soft tenderloin meat. Each has a distinct taste and texture. The tenderloin portion of the loin rib chop tends to cook more quickly than the loin portion. It's best to brine or marinate the chops, then sear them on high heat and finish them slowly. The loin rib roast is comparable to a beef standing rib roast or rack of lamb. The chine bones (or spine) are cut off to enable carving, but the baby back ribs are still attached. The center cut rib roast has 6 to 8 bones and is the most desirable as well as the most expensive. One of the most popular ways to cook a loin rib roast is for a holiday meal is a stuffed crown roast of pork. A boneless loin roast is cut by removing the side ribs and layer of back fat. Depending on the size and breed of the pig, the back fat can be almost 2-inches thick. The back fat is excellent for wrapping lean meats for roasting. The loin is tender and lean, but it can dry out and toughen with over-cooking. Canadian bacon (also known as peameal bacon) is made from cured boneless loin. One of the most popular and famous Italian recipes is for porchetta, a stuffed boneless loin roast wrapped in pork belly. Boneless loin can be cut into chops and butterflied. Similar to loin chops, the boneless loin can dry out easily if it's over-cooked. The tenderloin is a long narrow, tapered muscle that lies just below the loin starting behind the last rib. Because the muscle is not exercised by the pig, the tenderloin is the most tender cut. It has almost no fat and is very mild in flavor. The tenderloin can be roasted whole and cut into medallions or butterflied and grilled. The ham is one of the four primal cuts and is cut from the two rear legs of the pig just above the hock. The ham is arguably the most popular cut of pork. It's cut from the two rear legs of the pig and is sold fresh, cooked or cured. The USDA defines ham as fresh (uncured, whole leg), smoked, dry-cured and wet or brine-cured. The following article goes into detail about ham, how it is prepared and what to look for when you're shopping for a ham. The hock is the portion of the pig's leg below the knee and above the ankle. The hock is composed of meat, bone, tendons, and skin and requires long, moist cooking to become edible. It is cured but most often smoked and adds intense flavor to soups, stews, and braises. The pig's foot, cut from the ankle, is called the trotter. Until recently, trotters were used primarily in U.S. Southern cuisine, but they're now available as a specialty menu item at high-end restaurants. What Cut of Meat is Tenderloin Steak? What Does it Mean When Beef Is Rated 'Prime'?